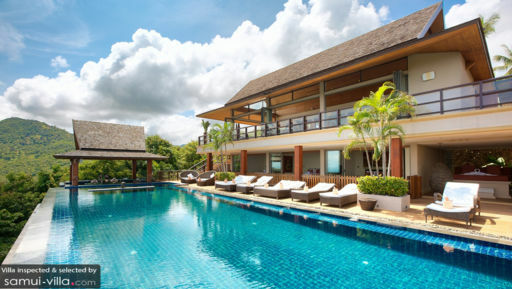 Villa Grand Vista lives up to its name with its grand architecture and a grand location on top of hill Bo Phut for the grandest panoramic seaview. The hilltop breeze in this exclusive property will leave you refreshed and rejuvenated. This exquisite retreat destination is furnished with various hues of brown, imitating the coziness of a rest house, but the grandeur of a luxurious mansion house. There are 5 finely appointed bedrooms in Villa Grand Vista. 3 of these bedrooms feature full-length glass sliding doors which opens up to give direct access to the outdoor pool area and of course, the breathtaking view outside. 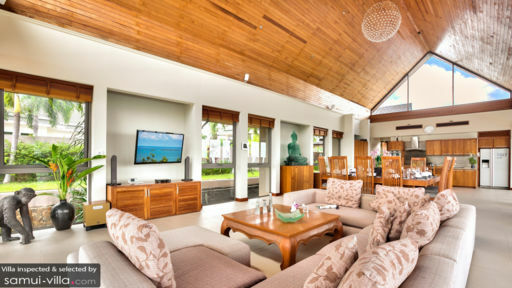 Each room is uniquely and stylishly furnished to a tropical sophistication with a king-sized bed, flat screen TV and ceiling fans. To add on to its lavish, all bedrooms are equipped with an en-suite bathroom with rain showers and terrazzo bathtubs. There are 2 rooms that are situated separately from the rest but with a similar luxurious interior. This bedroom opens up to a private balcony furnished with a dainty sofa, making it a perfect place to enjoy a scenic sunset. When it comes to a simple but an elegant outdoor area, Villa Grand Vista does not disappoint. 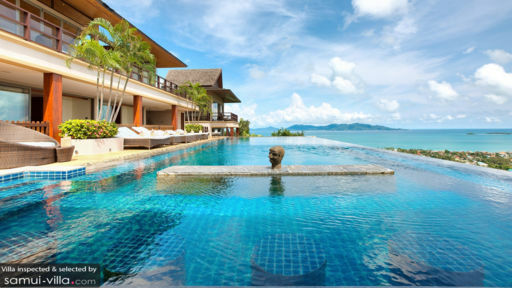 This villa features an impressive private 16 meter infinity pool that overlooks to a scenic land and sea vista. The sundeck which expands to whole stretch of the pool is equipped with multiple sun loungers to help you work on your tan while spending quality time with your family and friends. There is also a spacious veranda at the end of the infinity pool which is furnished with a dining table and a dainty couch area for an alfresco dining experience. The living area of Villa Grand Vista is on its top floor, boasting a scenic ocean vista with the refreshing breeze from the lush stretch of greenery on the property’s frontier. This area possesses a splendid high ceiling and a comfortable U-shaped beige sofa facing a wall-mounted flat screen TV for a meaningful quality time with your family and friends. Just beside the couch area stands a 10-seater wooden dining table for a hearty meal which you can prepare in the fully-equipped kitchen provided. On the ceiling of this whole stretch of living area hangs an exquisite chandelier which exudes luxurious feels throughout this getaway sanctuary. A whole expanse of glass-panelled doors across the living area opens up to an exclusive seaview terrace for you to relish the breathtaking scenery from the comfort of the rattan sofas provided. Here, you can enjoy an alfresco coffee time while watching either the sun rise of the sunset, whichever you prefer! Upon your arrival, experienced and trained on-site villa staffs will warmly welcome you. The service maids will help you keep the place neat and tidy while the guest manager will help you orchestrate your holiday plans to maximize your trip. A complimentary back and forth airport transfer is also included for your convenience. Bo Phut is only a 5-minute drive from the villa, it is one of Koh Samui’s old settlements and remains as a quaint fishing village with seafront houses converted into restaurants. You can also head to Fisherman’s VIllage within Bo Phut and experience a romantic atmosphere with a little privacy. Should you want to do waterskiing or simply relax, a 2km stretch of a tranquil beach welcomes you to paddle under the sun for the authentic summer vibes.